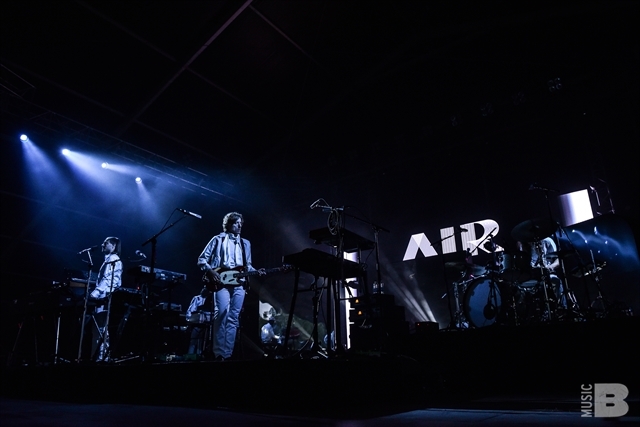 Governors Ball took place last weekend in NYC and while it was a great occasion on its own, something possibly even more monumental took place: the beginning of AIR's first North American tour in seven years. I actually caught their set at FYF in Los Angeles last year, but this time it was the start of something new. They were celebrating 20 years of greatness, as well as their recently released anthology, Twentyears. 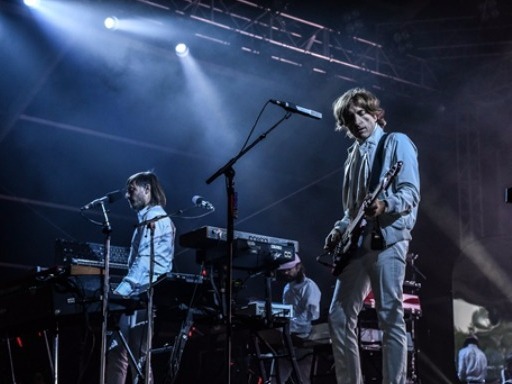 To say I wasn't intimated by their psychedelic magic and thick French accents would be a lie, but once they admitted that they still get nervous before walking on stage, well, it was all uphill from there. The band is now on tour, hitting cities like Boston, Chicago, LA, and more. Full dates here. Kirsten Spruch: How are you feeling? Jean-Benoît Dunckel: I'm feeling, how do you say, pretty excited for playing. KS: This is your first New York show in seven years. 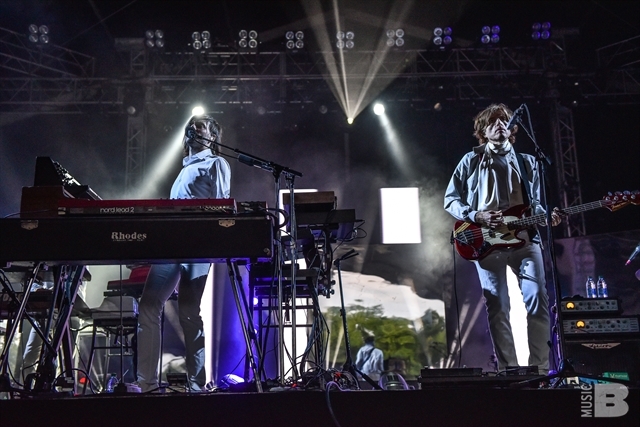 I actually caught you guys at FYF last year—it was such a great set. What can diehard fans expect to see tonight? JBD: I think as a band we've improved. We have a new drummer, we have the energy there, and we play really well. We have amazing conditions, amazing technicians, and so the sound is way more pure. It's really warm and clear and expressive. It's very expressive and I'm glad how it sounds. I think we are at the peak of what we can do live because we've learned so much from the past. Before we were just trying to reproduce something, but now diversions arrive with maturity. Nicolas Godin: I am excited. Yes, I'm always excited. But the American audience is very...I still get stage fright. I did not sleep well last night. I'm kind of scared. I'm a very stage fright person. KS: It's crazy that you still get stage fright at this stage. JBD: It's a good thing to feel a good mix in between fear and excitement. It gives a lot of adrenaline and some people are really addicted to it. To tell the truth, I feel addicted to that special feeling. You are scared but also you are excited to go not be scared anymore. I love it. KS: Right, because if you're not nervous, do you care? KS: How does it feel to have influenced so many other artists and their sound? KS: I think so, yeah, totally. NG: Because for me the music of Air is very hard to imitate so I never thought we'd influence people but maybe if you say so, maybe you're right. KS: Your sound is kind of timeless. The stuff that was produced a while ago still sounds fresh and new. NG: I can confirm that because when we play our songs on stage it sounds like we made them yesterday. That's the best achievement for a musician, that's the best gift that life could give to me as an artist. KS: Did you guys catch Phoenix last night, by the way? NG: Yes, very good friends of ours. We grew up in the same area, we've known them for so long and I was very proud of them. I think of where we are coming from, and they were here in New York after Wu-Tang Clan, you know. I couldn't believe it. It seems like a dream for me. KS: Your songs showcase a pretty good balance between rock and electronic. Kind of a Tame Impala type of psychedelic vibe. Do you have a favorite piece of gear that kind of creates that and marries everything together? How do you usually start a song? JBD: I think that every song is an example of how to do a song, and we don't have any special process. It has to be emotional at the beginning, you know, a melody or some chords, or it has to be emotional...when you play it on the piano, it has to exist already. We need an internal soul in the song. If you play the song with whatever instruments, it sounds good. So we have our tricks, we developed some tricks over time. We like, for example, the Fender Rhodes and those kinds of instruments, other keyboards. So we have some way of cooking the music. KS: This is so nerdy, but are you guys into hardware or do you do a lot of plugins, or...? NG: Oh no, we are old school. We use hardware, we have 14 keyboards on stage... not a lot of other bands do that. Most bands now use plugins and computers. We are very old school. 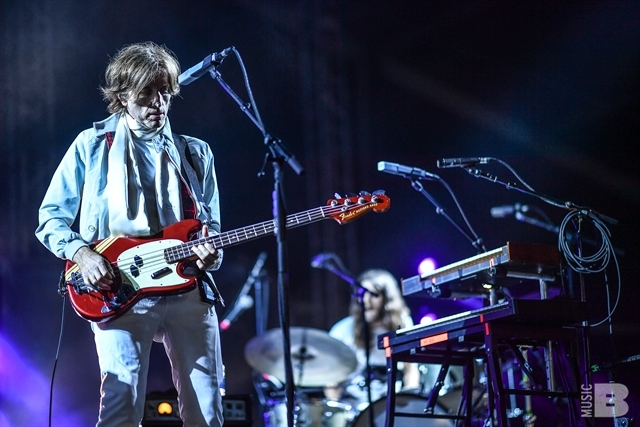 Everything we play on stage is actually played, there's no computer, no playback, nothing. So it's just pure, loud music. KS: And you guys are also working on your own solo projects, right? JBD: Yeah, we're doing something sort of now. But it's cool because you can give up other things and search for other techniques to connect with other people and discover new things. KS: And because, like we talked about, your sound is so fresh, do you think you can bring in new fans tonight, people that have never heard your stuff? NG: I think so. We do festivals all the time, like FYF last year in LA. and there were so many people. I'm sure for some it was their first time seeing us. KS: And in regards to the anniversary tour you're about to go on, which city are you most excited to play? I know you're playing some pretty prestigious places. NG: We like LA because it is like home since all our friends are there. Although we have friends here in New York, we have a really big family in LA with all of the artists we like. It's like playing at home. KS: I think that's a good note to leave off on. Good luck tonight!